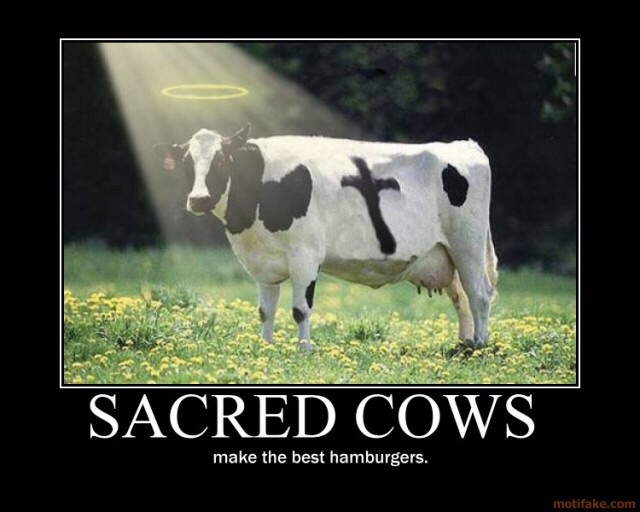 One thing all religions have in common is the sacred cow. No it’s not actually a cow, but its an idea, a concept. A core tenant of belief beyond challenge. It’s the place when you go there you are met with ‘that’s where you have faith’ or you are threatened with damnation should you simply question. The church of the Fridge is different though. There are no sacred cows in this faith. Not only should you question the mandates of the Fridge. You are actively encouraged to do so. Think the Fridge isn’t really God? That’s a good thing! Because that means you are thinking. The problem with Sacred Cows is a sorta paranoia begins to form the longer the cow exists. Look at a given religion, the person that challenges the authority of the cow, is the one that gets rejected and sacrificed by the community. Even when all they are doing is trying to change the community for the better. Better not embarrass the faith by pointing out the cow’s weakness. It means you get roasted by the ones in charge. But since the church of the Fridge is crowd sourced, there is no one leader. Everyone has access to the Fridge in their lives! So join with me. Open the door and find the sacred cow therein… that’s what’s for dinner tonight!